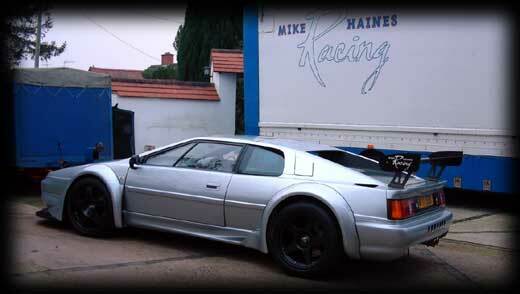 Mike Haines Racing had finished the majority of the modifications and suggested a test drive. At this stage most of the external mods were in place, but with the standard Lotus EFI ECU, standard instruments and adjustable TraxSpax dampers. Met with Rob C (and his white Sport350) and some of his Lotus friends at the Strensham Services on the M5. We had a look around the cars before doing a quick loop up the M5 to the Worcester North junction and back again. 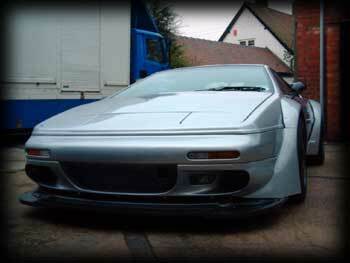 The car is very wide and sit extremely low - even for an Esprit. The suspension is a fair amount firmer than the Sport350, but not so much that it jars as you drive along. Don't get me wrong, you can feel every imperfection, but you don't get a hard jolt - there is still some compliance. The acceleration is fantastic - the power is delivered smoothly (as you'd expect with the same boost as standard), but on uneven road the wheels spin in 2nd, 3rd and 4th. The grip on an even surface is great but on this initial drive, I really didnt test anywhere need the limit of adhesion. It really does need good contact to get the power down smoothly. The extra power and torque are well complimented by the reduced mass. The steering is even more precise that I remember it, but I've lost a little of the steering lock which means you have to think a little more about tight maneuvering. I was glad of the harnesses because when travelling along the motorway, you tend to get bounced about a bit by the surface changes.